Hi, There are crack through the wall please advice - couple of time re-plastering done but still the problem persists. See the pictures attached. 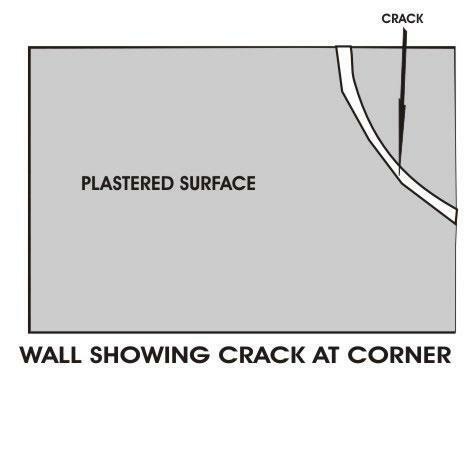 Cracks must be repaired immediately when observed otherwise the life of structure will reduce causing structural failure. They not only weaken the building but spoil the beauty of walls also. 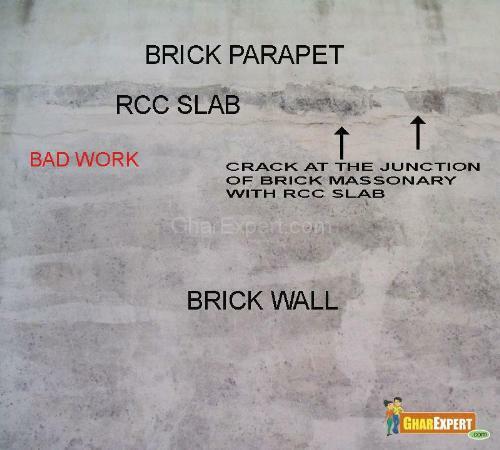 This write up tells you about repair of cracks in plaster, RCC member, Brick walls, Floor and Fine Cracks. The cracks can be prevented at the time of construction. 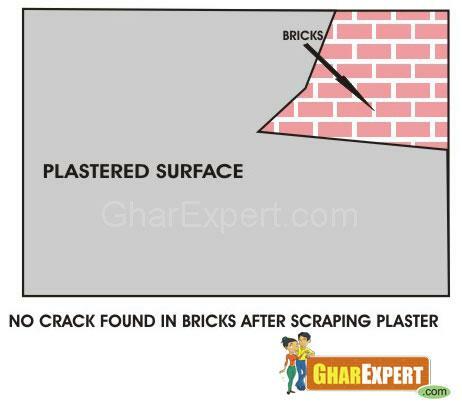 To know more about prevention of cracks during construction, click at the link below. 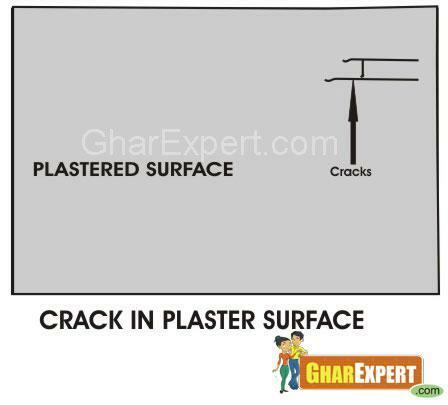 Two types of cracks are found on surface of plaster i.e. A. Crack with hollow sound in plaster. B. Crack with no hollow sound in plaster. Hollow sound can be checked by striking the plaster. Defective plaster should be removed and the edges should be slightly cut in square or rectangular shape to provide a neat joint. Clean the surface with wire brushes and wash it. Wet the surface 24 hours before application of cement mortar. 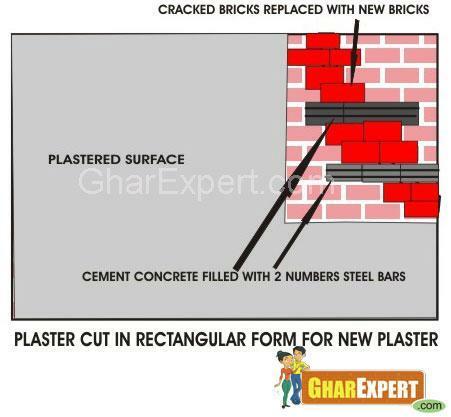 Defective portion should be filled in with cement mortar. Keep the surface wet at least for 3 days. When surface is dry, finish it according to adjoining area on the wall. Clean cracked portion of all loose materials and fill crack seal sealants in cracked portion. Finally finish the surface according to adjoining area. The cracked portion should be widen gently and be cleaned of all loose materials. Fill the cracked portion by pressure grouting or ‘guniting’. The material for such grouting can be epoxy or cement (with suitable admixture). Epoxy has more strength and adhesion than cement and can go into very thin cracks as fine as 0.1 mm. The surface should be finished according to adjacent area on the wall. Note: The cracks in RCC members/ structural members should be repaired immediately with consultation form structural engineer/professional. 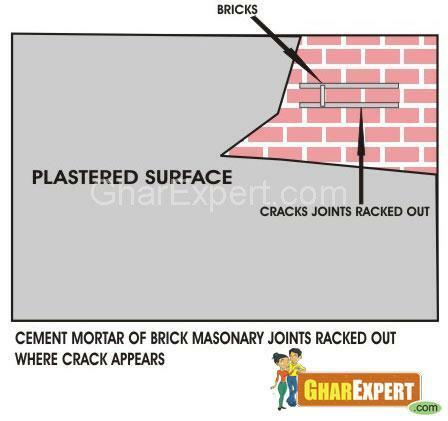 When two components having different elastic properties such as RCC slab and brick work abating each other, the crack on face of plaster is formed between these components due to their thermal expansion. 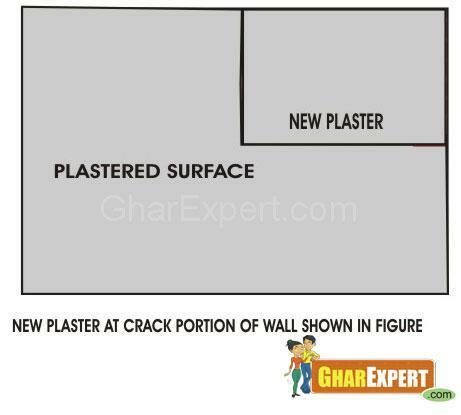 The plaster should be removed from cracked portion. The joints should be widened at least 20 mm to 25 mm in thickness. Clean old material by washing and brushing. Apply slight cut on edges in straight line to provide neat joint. Make the surface damp 24 hours before application of new plaster. 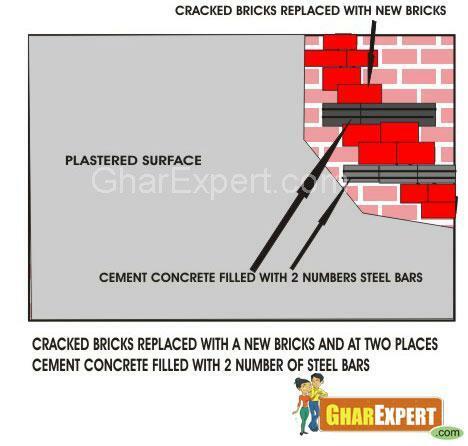 Cement mortar should be applied on defective portion. Make 20 mm wide and 25 mm thick groove at the junction of two materials/components. Keep the surface wet at least for 3 days. 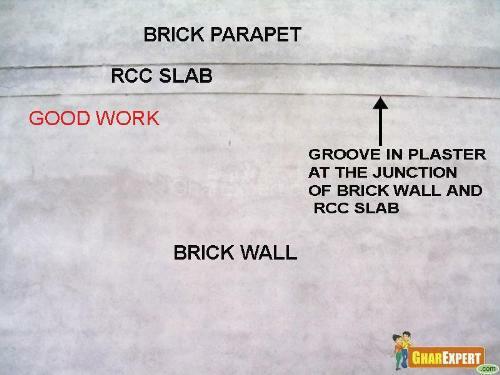 When surface is dry, finish it according to adjacent area on wall. 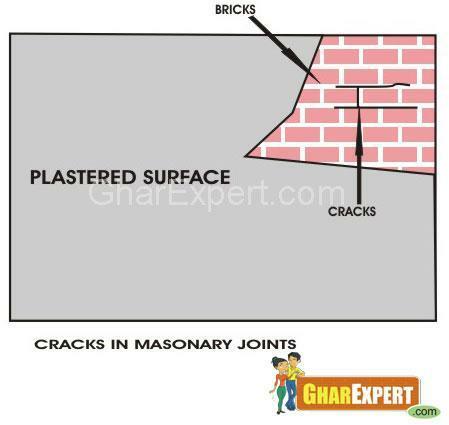 The mortar should be removed from cracked joint with the help of iron tools at least up to 25 mm depth. All loose material should be cleaned from cracked portion. Cracked portion must be kept moist at least for 24 hours before doing repair. Fill in the joints with cement mortar of coarse sand in 1:4. After filling the joints with cement mortar, keep the repaired surface wet at least for 3 days. After drying the surface, finish the repaired area according to the adjoining area. 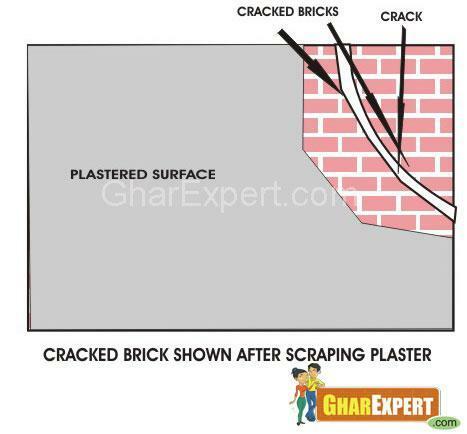 Before doing any repair of cracks, make sure that the cracks are stabilized and are not widening further. 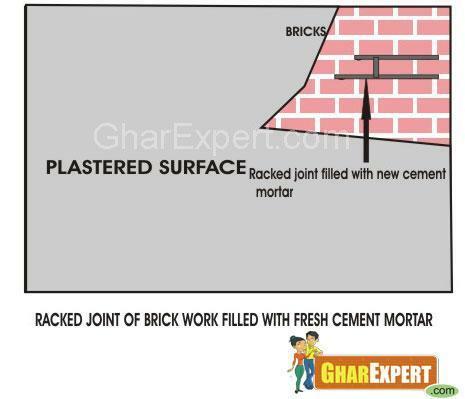 Remove broken bricks by scratching cement mortar from the joints gently. All loose material should be cleaned from the portion by brushing and washing. Wet the surface 24 hours before application of new plaster. Lay fresh cement mortar with coarse sand in 1:4 and fix new bricks. Fill all joints around bricks with mortar tightly with the help of iron tools. The repaired surface should be kept moist up to 7 days. When surface is dry, it should be finished according to adjoining area. Join date: Apr 2017 Thanks for the info Sir. Do I need ton consult expert/mason can do this job? Please advice. how to resolve the wall crack? for g+2 floors 12mm 6rods is ok in 1 pillar? or do i need to buy 16mm 6rods in 1 pillar ? Commercial Drywall: What's the difference? Can we construct 4inch wall on extended slab after horizontal beam ? How can we fill Wall Cracks before painting? Outdoor walls always take a beating from the wind, rain and changes in temperature, these results in cracks. They can .. 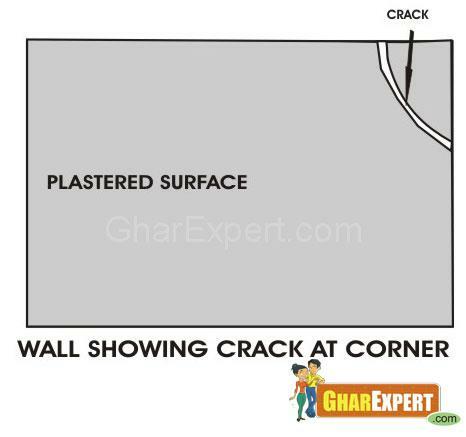 Handle the cracks in the walls initially because they can destroy smooth finishing of the plaster. 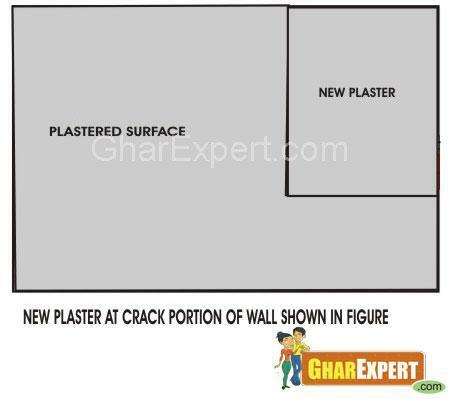 Which type of wall plastering is recommended for protection from the cracks? 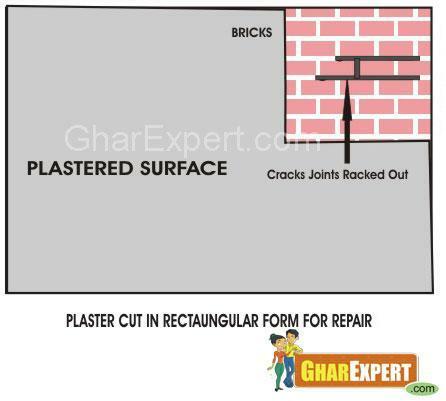 To avoid cracks, Earthen Plastering is applied. 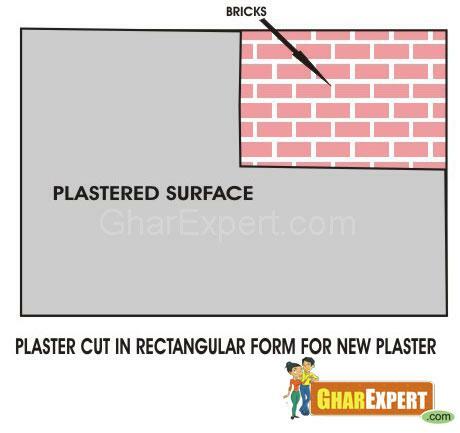 Clay in Earthen Plasters is Hygroscopic (water absorbing). Earthen wal.. 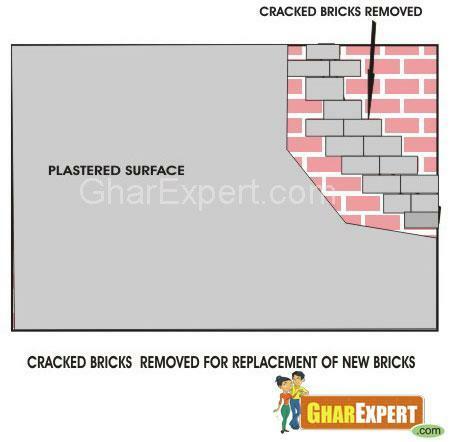 Whether you are going to paint a newly constructed wall or old one, These surface preparation tips will help you in ge..
What is recommended method to remove the cracks from building? The cracks are repaired by using low-pressure injection of epoxy or polyurethane foam repair material.